It is Teletronics' promise to offer the simplest and fastest resolution to all product related concerns. Languages Supported: English, Spanish, Portuguese, and Chinese. exchange or refund. Please follow these important steps when returning products. 5. Within the 30/60 business days, for all used items, there will be a restocking fee charge (0-45%). Depending on the condition of the item. Restocking Fee might vary. 6. All original materials must be returned in good resalable condition. 7. No refund, exchange or full credit will be issued after the 30/60 business day return policy. 8. Out-of Warranty items are repaired or replaced only with the customer's prior approval. Labor charges and freight will vary based on the condition of defective item. 9. Advanced Replacement Cases, must be issued within the 1 Year Warranty Period. 10. All RMA numbers automatically expire 30 days after date of issuance. RMA Case Number or an invalid RMA Case Number. 1. REPAIR WARRANTY: All warranties are void if Teletronics finds that the product has been abused, physically damaged or altered in any way without prior written authorization. 2. OUT OF WARRANTY PRODUCT: Out-of-Warranty Products are repaired only with the customer's prior approval. For Out-of-Warranty repair charges, please contact us at 301.309.8500 x136 or rma@teletronics.com. 3. PACKAGING: Please clearly mark the RMA number on the outside of the packaging. Damage or loss of goods during shipment is the sole responsibility of the customer. Product must be returned in original carton or in packaging of equal or greater quality. 4. RMA NUMBER: Any returned product without a valid RMA number or no RMA number will be refused and returned to the sender. RMA numbers are only valid for 30 days from the date they are issued. Please write the RMA number on the box in bold letters using permanent marker on at least two different sides of the box. 5. PRODUCT: Ship only the product(s) specified on the original RMA request and include any additional items. 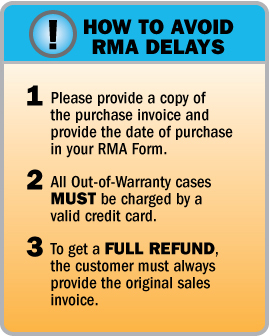 Any additional products will require a new RMA number. 6. SHIPPING COST: The customer is responsible for the cost of shipment to Teletronics and we will be responsible for the cost of shipment back to the customer. Ship to: Teletronics International, Inc. 2 Choke Cherry Road, Suite 100 Rockville, MD 20850 USA. 7. SHIPPING METHOD: All the repaired products will be shipping back to customers via UPS/FedEX Ground service. For International customers via Economic. 8. ADVANCED REPLACEMENT: If you are requesting Advanced Replacement for the defective product, you must provide us with a valid credit card number as a guarantee. Please Note: Advanced Replacement charges will be applied to the customer's credit card, if the defective product is not received by Teletronics within 21 business days. to ship the package the same business day.